I know this might sound cliché, but our little guy is the best thing that has happened to us. He is loud, very energetic but on the flip side he is a cuddly love bug and we just can’t get enough of him. Jack is the kid who can hang with the feisty one’s, wrestling and running. But if you put him with a mellow kid, coloring etc. Jack’s right in there being cool. So this birthday was interesting because we invited six other 3 year olds over and it was so fun watching all them interact and play together. 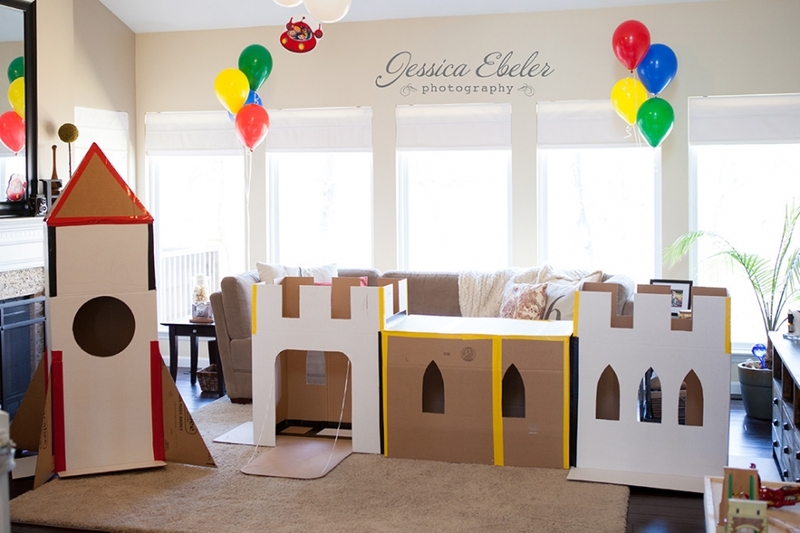 We had some crafts set up for the kids to do, just in case we needed to entertain, but they had fun playing with the train table and running around in the card board castle and rocket we had made. Over all the party was a success. If it wasn’t for Joe “my hubby” my crazy ideas wouldn’t come to life. The kids loved the cardboard castle and rocket….thanks babe! Jack was so excited about his cake, but if I was being completely honest it was probably more for me…wink-wink…I looooved it! I’m not sure what part of the day was his favorite, but I would have to say present time is at the TOP! US. We drug him away for a quick family pic. © 2019 Jessica Ebeler Photography|P4 Photo Blog by NetRivet, Inc.